How do you respond when people present their product/service to you in a way that makes it seem as if you don’t buy from them, you’re killing yourself, damaging the environment, and/or robbing people of basic human rights? And do you even listen anymore when this is the approach? Or do you tune these people out? This approach is what I refer to as fear-based selling. Unfortunately, this has become a common way for companies to market their product. These same companies are teaching their salespeople this same type of strategy. There are articles, books, and trainings teaching sales people how to sell using fear. You might be thinking, “Well if there are so many resources out there promoting it, it must work.” And, in some cases, you’d be right. However, it’s so overused at this point, people are tuning it out. They may also be avoiding you (if this is your approach to sales). We are bombarded every day with negativity and people are tired of it. Scroll through your newsfeed on Facebook, and you’ll probably see someone encouraging people to start posting funny videos, photos of kids or anything to lighten the mood. A few weeks back, I found myself in the audience as someone got up to talk about her company and products. The whole presentation was based on fear. She listed all the harmful things her company doesn’t put in their products, all the ways people are doing damage to themselves when using other products, and on and on it went. Please understand, this woman is a kind and smart business professional. She’s doing what her company is teaching her to do, use fear as a way to motivate people into buying her products. However, she was missing some crucial information in her presentation. She was missing the joy, the benefits and the positivity behind the products. As much as I like this woman, I found myself completely shutting down during her talk. In the end, I had zero interest to learn more because I operate under the premise of “Consumer Protection For My Own Mind.” This was something my NLP teacher shared with me years ago, and I’ve taken to heart. Negativity and the fear based approach doesn’t hold my interest. This doesn’t mean I take a “Pollyanna” approach to all areas of my life. It does mean, fear is not a motivator for me to spend my hard earned dollars. Now, here’s the kicker, her product is something that most people find joy in using. It’s not something most of us want to hear, all the “don’t do”/”shouldn’t use,” etc. statements when buying. We want to hear how awesome it is, how great it will work and the benefit it offers. This is just one example of the fear-based selling approach. We see it in our emails. We hear it being spouted out of people’s mouth’s at networking events. As I’m sure you’re aware, it’s also all over social media. It’s negativity overload and many people have had their fill. Please keep in mind; I’m not implying that you shouldn’t be sharing the cons. Instead, I’m suggesting to be sure you include the positives as well. 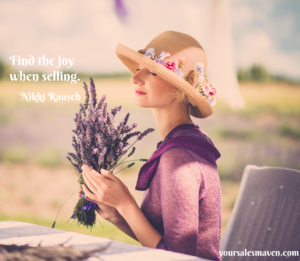 There needs to be balance in your sales approach. A few people will be attracted to the fear-based selling. However, many won’t. The idea of adding a balance of positive and some negative (when appropriate) will broaden your potential client base. For those of you unsure of how to bring out the positives when selling your product/service, let’s jump on a quick complimentary consultation call, and I’d be happy to offer you some additional resources.